Entwined presents Sacred Bellydance Workshop #2 – Sacral / Svadisthana Chakra – come and explore Taxeem, Infinity Symbols & Figure 8 movements and shapes to connect with your sacral chakra – the home of creativity, sensuality, dance and spirituality!Saturday 24th May 10.30am – 12.30pm, Dance Groove, Balanced Heart Centre, 100 Grimshaw St, Greensborough. Posted in Uncategorized on May 22, 2014 by entwinedbellydance. 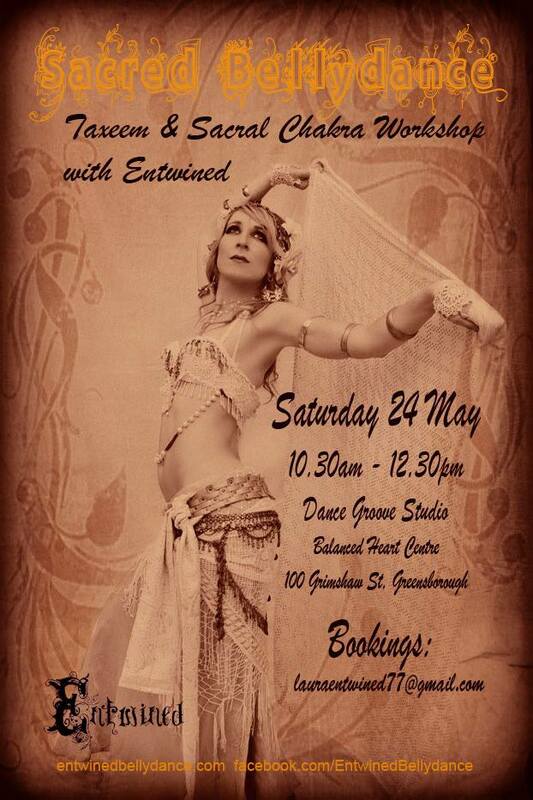 Join us for the 1st in a 4 part series of Sacred Bellydance workshops with Entwined, Saturday 17 May, 2014 at Dance Groove, Balanced Heart Centre, 100 Grimshaw St, Greensborough, Victoria, Australia. The workshops will be exploring Shimmies & Vibrations to balance and connect with the earth and base chakra. Please wear or bring something red to represent or connect with earth/base chakra. Suggestions: red hip scarf, red candle, red crystal etc. Workshop runs 10.30am – 12.30pm. Posted in Uncategorized, Image format on May 15, 2014 by entwinedbellydance.